Now, I’ll admit, I saw the movie first as a kid before ever reading the book. But since the movie was written by Peter Beagle as well, it didn’t stray too far. Plus, the book is quite a delight to read with some of the most gorgeous writing I’ve read in a time. The descriptions throughout are so clever and genius that they haunt you long after you’ve finished reading. And the story is one of the few in fantasy that leaves you with a bittersweet taste. Sweet for the goal has been accomplished, but sad because the guy doesn’t get the girl. I mean hell, the unicorn at the end says that she’ll never be like the other unicorns again, for she’s learned regret. Heavy hitting lessons, but no less real. Unicorn Quest Pit Stop #1: After she takes off from her special forest of magical-ness, the unicorn travels along the roads, shocked that no one seems to recognize her for what she is. After being mistaken for a mare several times, she’s finally kidnapped by someone who does know: Mommy Fortuna. But instead of helping her, the old hag locks her up as part of her carnival show. However, this is where she meets Schmendrick, the magician who also can tell her true nature. His loyalties don’t hold for too long with Fortuna, not when she’s holding a dangerous harpy and a unicorn captive. So he sets the unicorn free and they escape, although not without freeing the harpy who goes on to kill Mommy Fortuna and start a kickin’ sideshow in Vegas. Kidding. Just the first part. Unicorn Quest Pit Stop #2: Captain Cully’s Camp is where Schmendrick gets spirited away after a magic trick gone wrong. Seriously, the man’s a joke of a wizard and yet he manages to conjure up Robin Hood to distract Cully’s men long enough for an attempted escape—only to get captured again and tied to a tree. Luckily the unicorn is intelligent and wise, not blustering like this dude and frees him so they can go on their merry way. However, they don’t get too far before Molly Grue, Cully’s cook, finds them and more importantly finds the unicorn. She demands to join them and similarly to before, the unicorn tolerates her human companions. Unicorn Quest Pit Stop #3: The Final Countdown to Haggard’s Castle. This is where everything combusts. The Red Bull starts corralling the unicorn to the sea like the rest of her brethren, but Schmendrick pulls some real magic at last, turning her into a human. Molly and the unicorn berate him, although through the years, I never understood their reaction. They beg him to save her and he does and then they’re angry. Regardless, they head to Haggard’s Castle, with the unicorn as Lady Amalthea. Since she’s breathtakingly gorgeous, Haggard’s son, Prince Lir falls in love with her and becomes a hero to impress her. The longer they stay, the more human she becomes and eventually, she falls for him too. The quest surfaces again though and when they try to find the Red Bull’s lair, everything comes to a head and they’re stuck inside with the only way out through his tunnels. 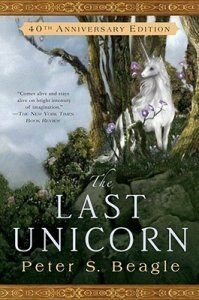 Prince Lir stands to defend his lady, but Schmendrick must turn her back into a unicorn. The Red Bull begins to herd her into the sea like the rest of them, but when he tosses Prince Lir aside like a limp noodle, the unicorn despairs and for the first time, fights back. All of the other unicorns come rumbling out of the sea as the last one herds the Red Bull to his death. Everything else seems to be prancing unicorns and joyous rainbows, but wait. Oh yeah, Prince Lir’s heartbroken and the unicorn must shoulder the burden of immortality having known love, having known fear and having known regret. If you haven’t read it yet, add the book on Goodreads, AND watch the amazing, amazing movie.